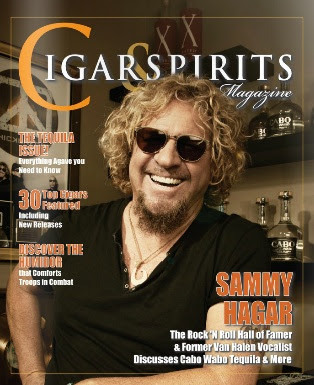 Sammy Hagar is the cover story feature for the first edition of Cigar & Spirits magazine. The new bi-monthly publication is hitting newsstands nationwide for the first time, and a recognizable figure like Hagar could help its launch. Sammy has made a name – and a handsome fortune – from his ventures into the spirits business: his Cabo Wabo Tequila is both award-winning and a success with consumers. Hagar went on to sell an 80% interest in the brand to Gruppo Campari, the world's sixth-largest spirits company, for $80 million a few years ago. It all began during his time as lead singer for Van Halen, and an investment in a little bar in Cabo San Lucas, Mexico. Last fall, Sammy launched his Beach Bar Rum in Hawaii, and it’s now made it way to the mainland. Check out a sneak peek at the new magazine here.